THERE was a time when plants which had not gaudy colored flowers were thought unworthy of popular admiration. But in these days we find beauty in lines, and in the relations of parts to the whole; beauty in expression, as well as beauty in general habit and appearance. Ferns, Palms, and other plants with no colors but brown or green, are now sought for with as much zest as the Rose or the Tulip; and indeed what are called "foliage plants," or those which have nothing to recommend them but what may be found in the leaves, are in high favor with persons of the most cultivated tastes. The plant which we now illustrate has nothing that would popularly be called flowers; for there seems to be only five long slender silk-like greenish-white stamens projecting from a small green base, and these united into a little bunch of about six or eight together, forming an insignificant tassel-like mass; but it is one which will have an interest for all who love pretty foliage. A good stocky plant growing in one's garden, and in contrast with more pretentious flowers, is sure to attract general attention. The plant from which the drawing was taken grew in the garden of the writer, from seeds gathered by him in Texas in 1873, and is always admired by those who see it. It will not, however, allow itself to be roughly used, and a branch soon withers or even drops its leaflets, when cut. In the specimen taken by our artist some of them had fallen before he had finished his task, as may be seen in his faithful reproduction. It is more interesting when in fruit than in flower, as the curved mass of greenish-brown immature pods make a pretty contrast with the lighter lines of its numerous small leaflets. If the main stems only had a little more lightness, and were somewhat curving as they often are in ferns, there would be few plants able to cope with it in this particular style of beauty. Both the genus and the species have an interesting botanical history. Some of the species have been long known, but they were classed with Acacias and Mimosas; plants with which most intelligent readers are more or less familiar. Michaux knew them as Mimosa, and in his Flora of North America, published in 1803, our present species is described as Mimosa Illinoensis. Willdenow was the first to detect the essential difference from Mimosa, and in 1805 established the genus Desmanthus as it now stands. The chief difference is in the seed-pods. In Desmanthus they are flat, membraneous, with several seeds (Fig. 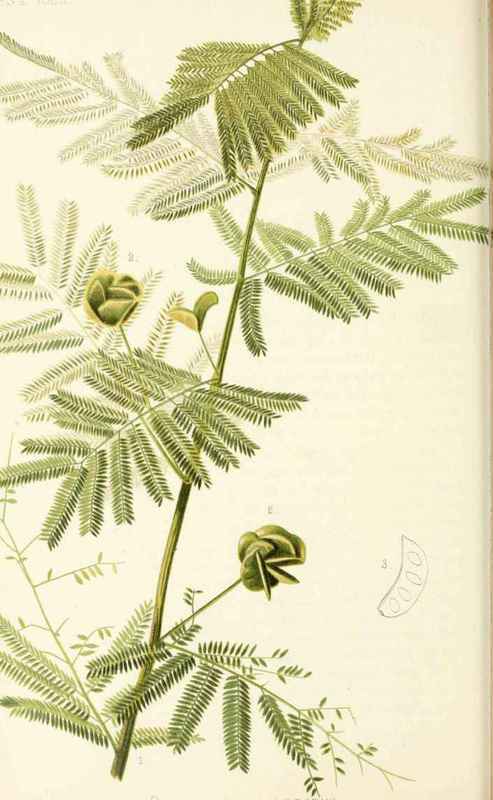 3), and split open at the edges as a pea or a bean would do; while Mimosa does not split open, but breaks off transversely into as many pieces as there are seeds in the pod. Succeeding botanists attempted to divide the genus still further, and Decandolle made a new genus of our present species, naming it Darlingtonia in honor of Dr. Darlington, of Pennsylvania, one of the most intelligent and esteemed botanists of the past age. The chief difference relied on to distinguish Darlingtonia from Desmanthus was in the sexual character of the flowers. In Desmanthus the flowers are not all with stamens or pistil in the same flower, but as botanists would say the flowers were polygamous; while in the proposed Darlingtonia they are always perfect, that is to say with all the parts necessary to completeness in each (lower. But in these days characters of this kind have little value in determining genera, and the more modern name of Darlingtonia has been abandoned for the plant's earlier name of Dcsmanthus. It is interesting to note that when Dr.
Darlington's friend, Dr. Baldwin, was appointed naturalist to the exploring expedition of Major Long, Dr. Darlington wrote to him jocosely, that he might perhaps find on his travels the "Dar-lingtonia ignota." Dr. Baldwin died at Franklin, Missouri, before the expedition had fairly started; his successor, Dr. James, "did find a species of the genus, afterwards named Darlingtonia," as Dr. Darlington himself remarks in his "Reliquae Baldwinianae," but only as we have seen already to be a veritable "ignota" in the end. However the good Doctor had the pleasure to know before he died, that a good substantial genus of Californian pitcher-plants was named in his honor by Dr. Torrey, and which will keep his memory much more fresh among lovers of plants than ever our Desmanthus would have done. Desmanthus brachylobus does not appear to have any common name in our country. Aiton says at the time of its introduction into England it was known as the " Illinois Acacia," the name no doubt suggested by the botanical name of Michaux. It seems best to adopt this name now though it is not a true Acacia, because it is best to put up with a name of imperfect application, rather than to multiply synonyms. After all there is much more appropriateness in this common name than in the common names of many plants, for it is the most northern species of any near representative of the Acacia tribe. It extends up the drier regions of our country to the line of the Mississippi and Missouri, from Texas to Kansas and Iowa, where it forms a very interesting part of the prairie adornment of those States. It does not seem to extend far in from the Mississippi on the line of a moister climate towards the Atlantic Ocean, for Dr. Chapman does not include it in his "Flora of the Southern United States." It may be noted that while our species seems to avoid moisture, one species in the Eastern Hemisphere floats on water, and has been named Desmanthus natans in consequence, and which, indeed, one botanist endeavored to place in a new genus named from its floating habit, Neptunea. Almost all our commentators say Desmanthus was derived from desma, a bundle or bunch, and anthos, flower - Greek words - "because the flowers grow in bunches." But as the flowers grow no more in bunches than numerous others, it is not easy to understand how this should suggest a particular name. When Willdenow had the new genus in contemplation, he had before him for Desmanthus, Mimosa virgata, - the last name from the Latin virga, a tough, slender twig, and this renders Dr. Gray's explanation from "desma a bond," more plausible. 1. The upper portion of a flower stalk. 2. Cluster of immature seed-vessels.